A seasick sea Captain commands an amusement pier despite local opposition. Sailor, sailor, home from the sea - where little stranger can there one be ? Charlie: Hey, bus driver! I can go away for *ten* years and get my own wife back! 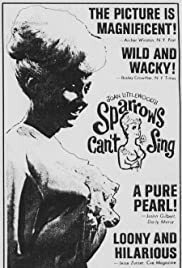 Derived from her own Stratford East stage show, this Joan Littlewood film apparently did no better than its non celluloid counterpart. Now it appears fresh, confident and so evocative but I have never seen it before and like many, I suppose, wouldn't have been the slightest bit interested at age 16 in 1963 with the Beatles and all that was to follow. Seen now, however, with all that location shooting and streets that are gone depicted so well. And what irony! The fabulous extended opening shows our hero/villain returning from sea to find his wife and cannot even find his house. Bulldozed slums, replaced by brand new 18 storey blocks of flats and even they bulldozed in turn in 2000. Back to the film and it is non stop believable banter and jesting. The film does not let up once and only in the final splendid sequence in the pub do we see a trace of the theatrical origins. For anyone who has ever visited or lived in London, absolutely essential. For every one else, well worth seeing to get just a glimpse of the old East End and just an inkling of what it really was once like when everybody seemed to know almost everyone else.